I mean, it makes sense that it’s symmetric in terms of — so that no one vector is privileged over another. But it still seems magical. I mean, even when I know that the determinant of a matrix gives you the area of a parallelogram, it still seems so special that the determinant of a matrix can give you the volume of a parallelepiped. So we worked on proving that fact, with what we know about vectors. There are two hard parts to this proof. One is understanding that the volume of the parallelepiped is the same as the area of the base times the height. (And teasing out what the “height” actually meant.) At this point, I whipped out Cavalieri’s Principle. It was in this discussion that one of my kids said the most awesome thing. 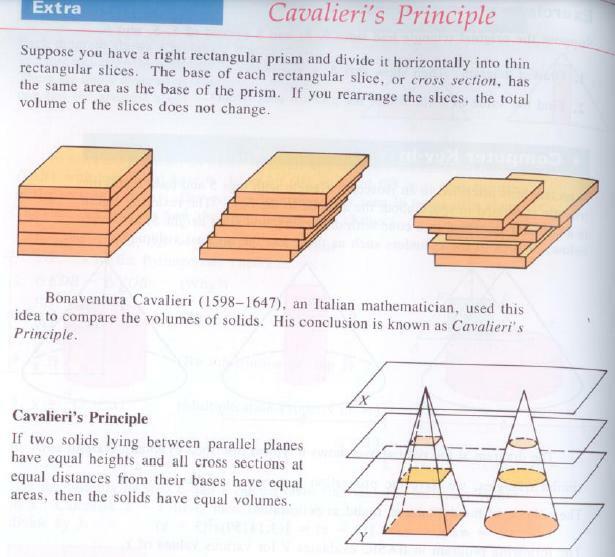 When talking about Cavalieri’s Principle, he said: it’s like if you had 10 reams of paper all stacked up to make a cube. That has a certain volume. Then you push the stack so it leans — maybe so it’s a little curved. What’s the volume of the new stack of paper? The same. So we understood what the “height” of the parallelepiped actually referred to. The very last question: how do we find that? And in fact, my kids actually figured that part out without any help. They noticed it involved the projection of one vector onto another. I said that — suppose you are riding a horse. I mean unicorn. That can fly. But only in the direction of it’s horn. And you are told to go to a particular planet and wait there. At the starting gun, the magic, flying unicorn takes off, flying in the direction of its horn. I am 99% sure this didn’t help kids “get” it. It was pretty obvious to them that a point and a direction (vector) uniquely determine a line. But I really enjoyed talking about the flying unicorn. I liked it enough that I think the flying unicorn may be our mascot for the year. It’s not magic, the geometry is obscured by the vector algebra. In geometric algebra, a^b is the area of the parallelogram in 2D and a^b^c is the parallelepipid, just as you would expect. The cross is simply redundant as well as only working in 3D. All good stuff, and I like that you pulled out Cavalieri’s Principle (which was probably covered in a Geometry class they took in 8th grade). Seeing stuff from that far back reflected in high-powered math is really groovy and can make a big impact. All that said, the best part is the unicorn and the sparkles. 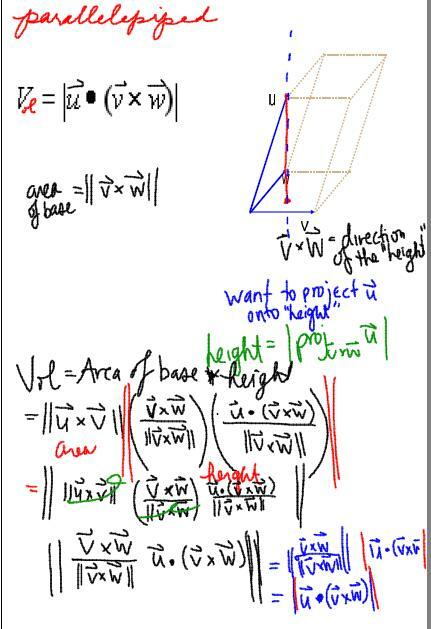 “In multivariable calculus today, we were talking about the scalar triple product. It blows my mind that if you have three vectors” should be the opening to a screenplay. It’s funny. We were hanging out at the Met the last time I was in NYC, and she drops this, “A guy in my school has a really cool way of thinking about math. You should check out his blog.” She followed up about it a few days ago, and I about fell out of my chair (or wherever I was sitting) when I learned that he was you, and that blog was this, and that this was one that I had/have been following for a while. Small world, indeed (which gets smaller the further you move away from it, which would make for a nice lesson on perspective and geocentrism and may scientific notation, too). By the way, how cool that you guys are in the same building. We were in grad school together, and for a full year I looked at her across the math methods table and thought, “I hope I get to be that smart one day.” No doubt you’re going to have a really fun year. Your principal hit the bifecta with that one, huh? To me, the real mystery to be explained is why the explicit component formula for the cross product should produce something with the right geometric meaning. In particular, why should the magnitude of this somewhat random-looking combination of the six components equal the area of the parallelogram? The usual proof (e.g. in Stewart) is not very long, but it’s unmotivated algebra, and it goes through trig, which shouldn’t be necessary. So instead, I start with an investigation of area in 2D, beginning with (relatively) clear geometric principles (in particular, a special case of 2D Cavalieri, which says that a shear transformation doesn’t change area) and deriving the usual 2D determinant formula. Then I take them into 3D and get lots of cool facts, including the usual formula, and most important, its interpretation as (signed) volume, for the 3D determinant. After that it’s very easy to get a lot of understanding of an n-D determinant, as well as some faith that it does calculate an n-D “volume”. 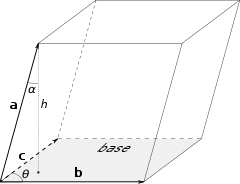 The cross product then comes out as an adjunct of the fact that the determinant measures 3D volume; it’s essentially “a 3D volume calculation waiting for the third vector”. I don’t claim to have perfected that part of the story, but I do use it to supplement the book’s treatment, where the formula is dropped out of the sky. I didn’t make this story up myself; it’s my attempt to bring down to earth a rather advanced and elegant formulation of volumes, determinants, and related phenomena, of which the cross product is a special case.